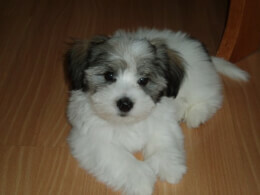 The Coton de Tulear, also called the "Coton" or the "Cotie" is a small, happy, loyal purebred. Native to the island of Madagascar, this curious companion became known as the "Royal Dog of Madagascar" because of it's popularity among the main tribes of the Island in the 16th and 17th centuries. 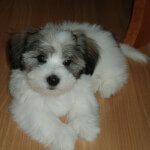 The Coton De Tulear is a companion dog. These fluffy little family pets are best with people who have some dog experience. 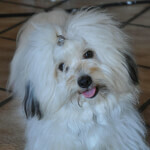 Because they are so incredibly cute, a lot of people might let Coton de Tulear behavior problems slide by. Although they are very small dogs, they still need a strong-minded owner who will take charge. One of the most basic facts you should know is that many problems come from anxiety, and your Coton needs to know that you can handle things to prevent such stress! 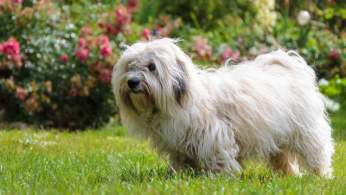 The Coton de Tulear is a small breed. Typically weighing between 11-15 pounds. The Coton stands between 9-13 inches tall. The Coton is soft-hearted and loyal making it the perfect companion for various family types. The breed's sense of curiosity makes it a friend to anyone and everyone. In situations in which the Coton is around young children, strict supervision is recommended (as with any dog). Because of the breed's sweet temperament you can expect them to get along nicely with strangers and other animals alike. However, they will serve as a decent watchdog, warning of strange noises with a bark. But keep into consideration if you desire a guard dog, you may want to choose a more aggressive breed. To keep your Coton happy and healthy, mild effort is required on your part. Implement exercise into your Coton's life according to your lifestyle but be sure to take a consistent, attention to detail approach in the areas of training and grooming. 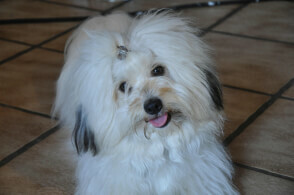 The Coton de Tulear is indigenous to the island of Madagascar in Africa. They are known as the "Royal Dog of Madagascar" and are named after the bay of Tulear. 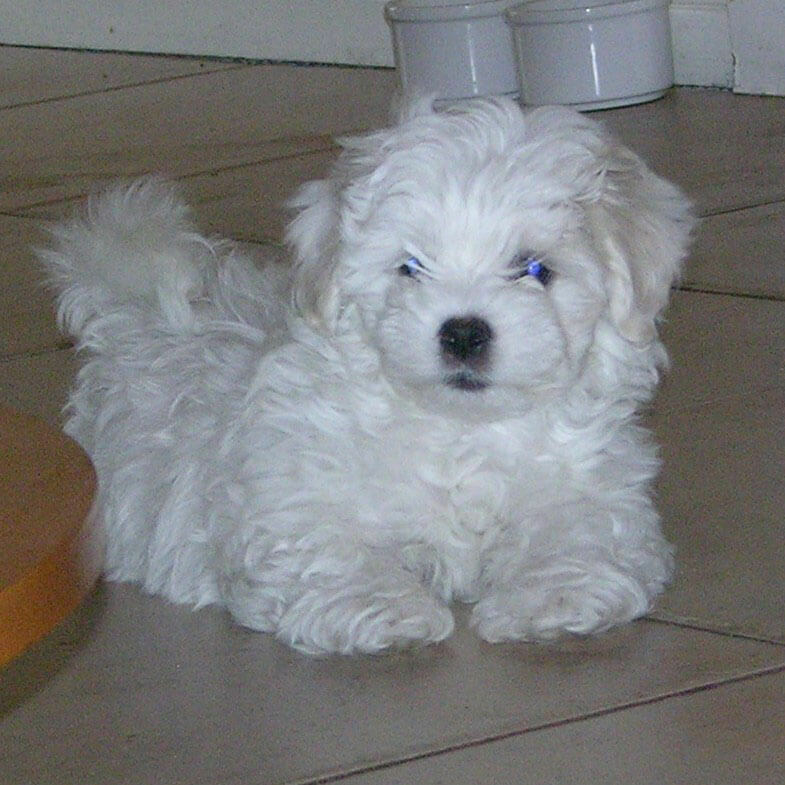 This breed is related to European breeds such as The Bichon Frise, The Tenerife Terrier, and the Maltese. The ancestors of the Cotons likely came along with pirates as companions who established a base in St. Mary's Island, Madagascar in the 16th and 17th centuries. The Coton became popular amongst the lead tribe on the island, The Merina tribe. They were sometimes given as gifts and became a favorite companion to the wealthy of the Island. In 1973, a man by the name of Robert Jay Russell, whom was at the time studying lemurs on the island, discovered the breed and brought them to America. Though they migrated to other areas of the world including Europe, America, Canada and other various places they kept the reputation of the "Royal Dog of Madagascar". There are many legends and folklore about the Coton, most of which hold little to no truth. Although their early history is mysterious, the Coton never hunted alligators and boars, or fought off hungry alligators. This breed was recognized by the Social Centrale Canine (the French national kennel club), the Federation Cynologique Internationale, The United Kennel Club, UK in the toy group, and the United Kennel Club, US in the companion group. 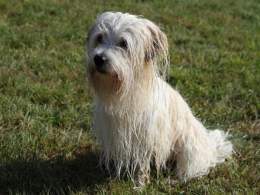 The Coton de Tulear was on their way to being recognized in America in 1996, but did not become official until July 01, 2014. 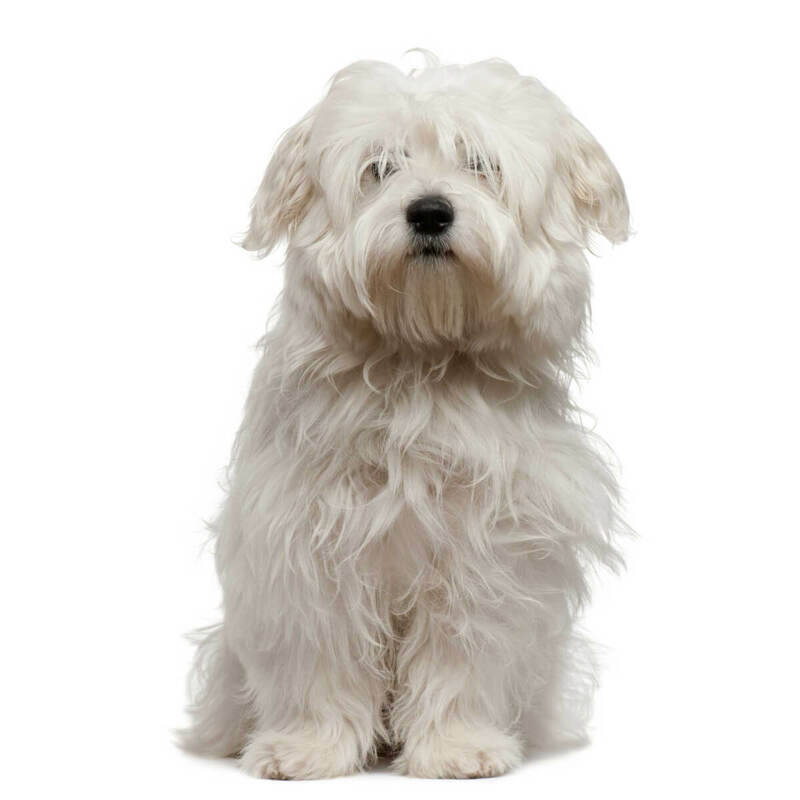 The Coton de Tulear is infamously recognized by its medium-long, soft white "cottony coat" similar to cotton, hence the name "Coton". They are small and compact, yet stout and sturdy. The body of the Coton typically consists of more length than height. They have a black noses (sometimes dark brown) and and dark eyes that express a twinkling kindness. 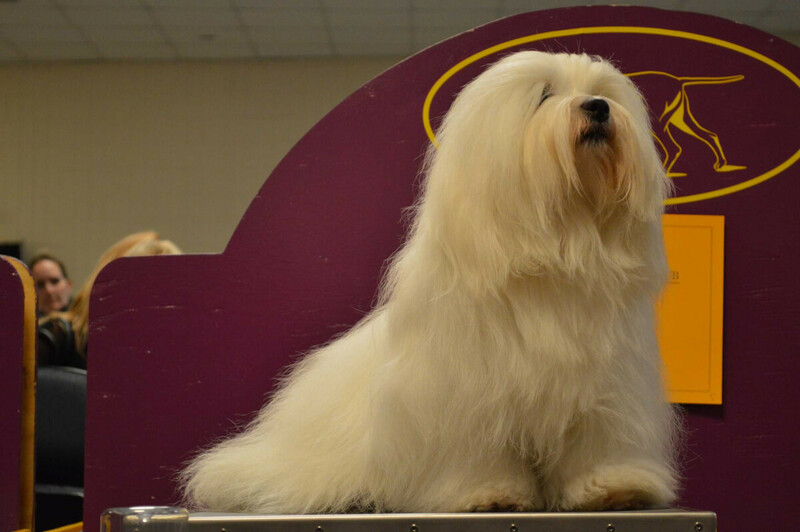 The Coton's dark features against its pure, cotton white colored hair creates a beautiful contrast unique to the breed. The tail possesses a prominent curl that rests on its back. They have perky ears that triangle straight up. The breed also possesses shorter legs and an expression almost similar to a smile. 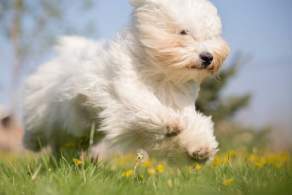 The Coton de Tulear colors range from white, honey, champagne, black and white, or tricolored including markings of tan, brown, or "honey bear". The Coton may also have dusting of darker colors on the ears or body. Puppies who have darker coats will fade to lighter colors with age. 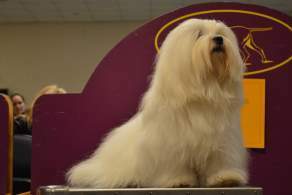 According to The Federation Cynologique Internationale, a range of national Kennel clubs,the Coton de Tulear's coat should be all white. The American Kennel clubs recognize the other variations of colors. Show breeders prefer the Coton to be completely white. 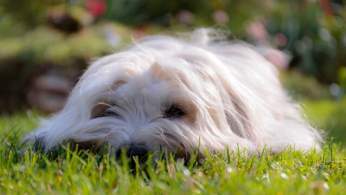 The Coton de Tulear is a small breed. 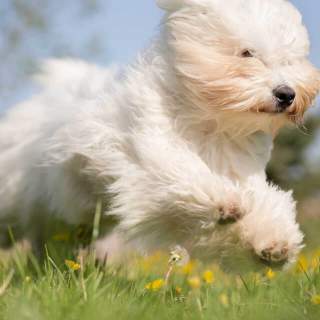 According to the Coton de Club of America, the standard weight of the breed is on average between 11-15 pounds, no heavier than 18 pounds. The standard height is between 9-13 inches tall. However there is a rare tall Coton, which is 15-17 inches tall and can even appear out of a litter with standard sized parents. There is very little variation among purebred members of this breed. The Coton De Tulear is a small breed of dog already so, as of now, there isn't much interest in creating a Mini, Teacup or Toy Coton de Tulear. The coat of this breed is medium-long and fluffy like cotton (hence the name). If you see a short haired Coton de Tulear it is likely the owner clipped or shaved them for convenience purposes. Cutting the hair does not "cool them off", as some mistakenly believe; a dogs coat is particularly good at keeping them warm or cool as necessary. The Coton de Tulear is loving, curious, and loyal. They are diverse and intelligent with the ability to adapt to various environments and activities according to the owner's life. They are full of joy and live to entertain. Dating back to its early history, the Coton has always been a companion. They earnestly desire to be loved and noticed by their owners as well as others. This breed is one that loves to be the center of attention. The Coton becomes strongly attached to their owners and do not enjoy time away from them. One interesting trait among Cotons is that they tend to be more energetic in the evening time. If you're a night owl, this dog will keep you great company. The witty, carefree, attention seeking Coton will thrive around children that enjoy the company of animals but at the same time know how to respect them. Some children are too young to understand that squeezing and grabbing is not appropriate for smaller dogs, like the Coton. These situations should be closely monitored with almost any small breed. Cotons prefer being around people but when left alone by their owners, they will be happy and thankful to have another pet around to play with. This breed does not particularly like to be left alone because they thrive in atmospheres in which they can receive lots of attention. They don't have a hunting instincts as some folklore legends may suggest, so being around other animals will not be risky. The Coton de Tulear is curious in nature and loves meeting and exploring new people. When it comes to intruders, in most cases the Coton will bark to alert its person if it hears suspicious noises. They tend to be more active at night so its not likely that the Coton would dismiss any out of the ordinary activity. 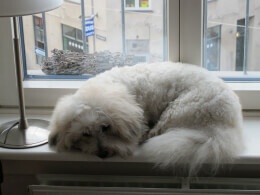 The Coton may make a great watchdog but they are far too small and friendly to hold any weight as a guard dog. Below are pictures of the Coton De Tulear dog breed. The Coton de Tulear requires medium effort to maintain physical and mental health. Grooming is a daily task, where other breeds may only need weekly or bi weekly brushing and washing. They are low key in the area of exercise. Training your Coton is also in the medium maintenance category. In the beginning it could prove to be slightly difficult to potty train this breed. however as with many other breeds, positive reinforcement and consistency provide success when training your Coton. 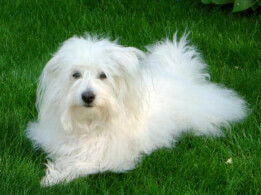 The Coton is considered a "non-shedding breed" and has low dander which is similar to dandruff in humans. 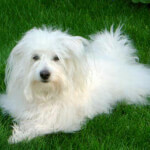 As opposed to fur like other breeds the Coton is considered to have hair. The unique coat causes the loose hair to get stuck in itself. Similar to a spider's web, the hair is caught there until it's combed out and removed. 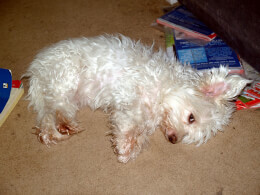 Puppies, while their coats are still growing, may require more grooming. The coat should be brushed and combed out daily, removing loose hairs to prevent matting and tangles. If the coat becomes matted due to a failure to keep the coat brushed, shaving the coat completely may be required. This breed is also considered hypoallergenic. The Coton should be bathed on a weekly basis. Brush teeth 2-3 times per week. Trim the hair around the eyes and ears as well as the nails as necessary. The Coton de Tulear can be kept healthy and fit with a short walk daily, regular playtime, or a supervised swim. The way you exercise your Coton is solely based on your preference. A little bit goes a long way. The Coton de Tulear is a small breed and should be kept indoors to keep them safe from larger animals that may try to hunt and kill them. This breed is diverse and adapts to any environment. The Coton adapts to various climates including hot and cold areas. They can even play in the snowy and rainy climates. But they should always live indoors.